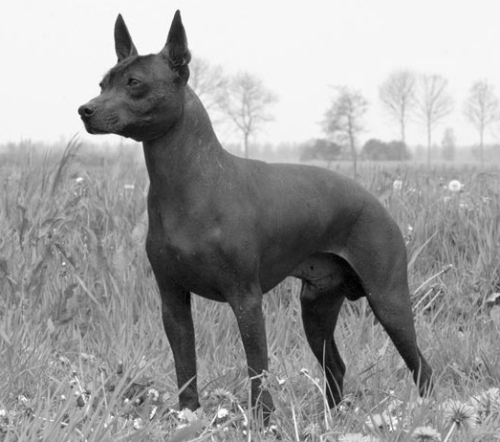 Xoloitzcuintlis (Xolos) have been around for thousands of years. They became famous in history for helping souls get to the afterlife, having healing powers, and protecting people from evil spirits. The name Xoloitzcuintli (pronounced "show-low-etz-queent-lee") is derived from the name of the Aztec Indian God Xolotl and the Aztec word for dog Itzcuintli. 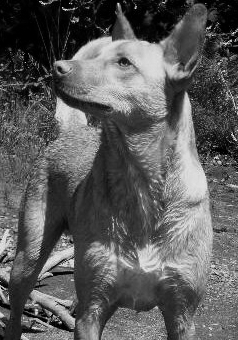 The Xolo is one of the world's oldest breeds, dating back to over 3,000 years ago. Archaeological evidence suggests that the ancestors of the Xolos accompanied man on his first migrations across the Bering landmass - now submerged - from Asia to the New World. Clay and ceramic effigies of Xolos have been discovered in the tombs of the Aztec, Mayan, Colima, Toltec and Zapoteca Indians. 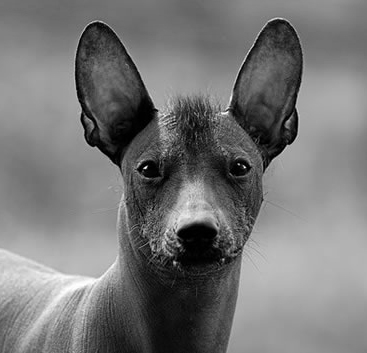 Today, the Xoloitzcuintli is viewed as a national treasure in Mexico. According to Aztec mythology, Xolotl (the God of lightning and death) made the Xoloitzcuintli from a sliver of the Bone of Life from which all mankind was made. Xolotl gave this gift to man with the instruction to guard it with his life. In exchange, it would guide man through the dangers of Mictlan, the afterlife or underworld, toward the evening star in the heavens. In ancient times, Xolos were often sacrificed so they could be buried with their owners to accompany their souls on their journey to the underworld. The native people regarded Xolos as guards and protectors, believing they would safeguard their homes from intruders and evil spirits. They also believed the dogs had mystical healing powers for a variety of ailments, including asthma, rheumatism and insomnia. The Xolo's reputation as a healer persists to this day in the rural parts of Mexico. The Xoloitzcuintli stands out for being hairless, although there is a coated variety. Actually, the coated variety is the original form of the dog. The dominant hairless trait originated in this breed as a spontaneous genetic mutation thousands of years ago. The coated variety is covered with a short sleek tight fitting coat. The hairless variety is completely without hair, although many have a short tuft of coarse hair on top of the head, the paws and tip of the tail. The chromosome responsible for the loss of hair is also believed to have affected the dog's dentition - hairless dogs typically have an incomplete set of teeth and often have primitive tusk-like canine teeth. As ancient civilizations became modernized over the centuries, the number of Xolos declined, almost causing them to become extinct. The Xolo was first registered with the American Kennel Club in 1887 as the Mexican Hairless breed, but was dropped in 1959 due to insufficient numbers of dogs being bred and registered. In 2011, the AKC brought the breed back. Their numbers have increased, but Xoloitzcuintlis are still uncommon dogs.